Underground Coal Gasification (UCG) is a classic example of extreme energy in action. As tunnel mining has exhausted accessible seams of high quality coal in many parts of the world (in the UK, which started earliest, coal production peaked in 1913) opencast mining has expanded to target lower quality seams close to the surface. Now with even opencast mining in decline in the UK, the focus is moving to exploiting deeper unminable coal seams via UCG. The process uses similar drilling technology to other unconventional gas extraction methods, like Shale Gas and Coal Bed Methane (CBM), but with the added twist that it involves setting fire to the coal seams in order to gasify the coal. The process involves drilling two parallel wells down to (and usually horizontally through) a coal seam and joining them at the end with some method (e.g. directional drilling or hydraulic fracturing). Air (or possibly pure oxygen) is injected down one well, the coal is set on fire and partially burns, producing a stream of gases. Water flowing into the cavity from the surrounding aquifers is also consumed in the reactions, but this may be supplemented by injection of water or steam. At the surface the gases produced are separated into carbon dioxide, water and the syngas (consisting of carbon monoxide, hydrogen and methane). In addition large quantities of waste (carbon dioxide and contaminated water) are produced. Chemically the process is very similar to that used to make town gas, from coal, before natural gas was widely available. As with that process, a side effect is the production of a witches brew of highly toxic and carcinogenic coal tars. These old gasworks are to this day some of the most highly contaminated industrial sites. Contamination by coal tars has been linked to cancer and disease clusters around the world. The main difference from these old gasworks is that UCG involves gasification out in the open environment rather than in a sealed retort, massively increasing the probability of contamination. See our previous article (Underground Coal Gasification: Hellfire and Damnation ) for more details. Up until now UCG has only been undertaken on a small scale, usually just for testing purposes. While UCG has a long history, the idea was first suggested in 1868, to date it has never progressed to large scale usage. The first concerted testing began in the Soviet Union during the 1930s. In the US and Europe a series of trials were conducted from the 1940s though to the 1990s. There were a small number of attempts to go beyond testing but still on a small scale in the Soviet Union, of which one plant survives at Angren in Uzbekistan. Given the costs and difficulties associated with UCG, it is only now that energy prices have risen so high, that it is being seriously considered for large scale deployment. There have been a number of well publicised failures of UCG, such as the Hoe Creek trials in Wyoming in the late 1970s and the more recent closure of the Cougar Energy plant at Kingaroy, Queensland in 2010, both of which resulted in contamination of ground water with toxic and carcinogenic byproducts of the process, such as benzene and toluene. Almost twenty years after the Hoe Creek trials a Department of Energy report concluded that groundwater contamination posed a significant potential risk to humans and livestock (PDF file). At Kingaroy the well exploded after only five days of operation and resulted in benzene and toluene being detected in the groundwater and in the fat of animals grazing on the surface. As a result of this the plant was ordered to be shutdown and dismantled by the Queensland government. There have been a number of other trials over the last few decades which have not received this sort of attention. For instance the Rocky Mountain I trial in Wyoming in the late 1980s and the El Tremedal trial in Spain in the late 1990s are held up as examples of highly successful trials. Closer examination, beyond the publicity of the UCG industry, tends to reveal a different story. During the Rocky Mountain I trial benzene levels in the groundwater rose as high as 35,000 parts per billion (when even a few parts per billion is considered dangerous) and only returned to normal after extensive post-burn cleanup operations, which would not be possible on a industrial scale. The two most recent UCG trials in Europe were conducted in Thulin, Belgium (1982-1985) and El Tremedal, Spain (1997). Both were highly unsuccessful, despite subsequent PR spin to the contrary. At Thulin, after an initial failure to properly connect the two wells, there was great difficultly in achieving a stable reaction. At El Tremedal a similar lack of control of the process led to even worse results, when there was an explosion in the gasifier deep underground. This propagated up the well to the surface, causing a blowback of phenolic liquor, rupturing the well at the surface and coating the site with residue (i.e. a mixture of toxic coal tars and water), after which the trial was terminated. The only place where UCG has been taken into long term production is the Soviet Union and there only on a small scale. About five plants were operated in various places at various points, of which the plant at Angren is the only one still operating. Again the Angren plant, now owned by Australian company Linc energy, has been held up as an example of a success story and in particular the fact that it has been operating for several decades. However it does not appear that any environmental monitoring of the plant has ever been carried out and the area around Angren is now plagued by cancer, so this “success story” does not look so good up close. A major commercial UCG push has taken place in Australia over the last decade, with private companies taking over from government agencies as the main driving force behind UCG. Three companies in particular, Linc Energy, Carbon Energy and Cougar Energy have run trials in Queensland. In addition to the previously mentioned Cougar Energy trial, Carbon Energy’s trail at Bloodwood Creek was also shutdown due to environmental issues. 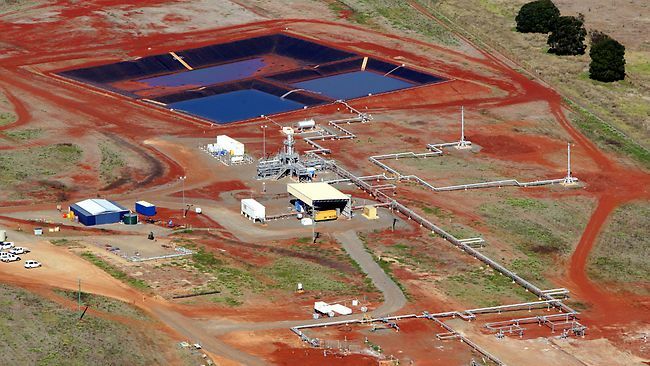 The fundamental outcome of these trials is that while the companies are still hoping to develop UCG there, the Queensland government has delayed commercialisation of UCG for the foreseeable future. Seeking places where they will be monitored less closely, these companies are now setting up join ventures abroad: Linc in Africa, Carbon Energy in China and Cougar Energy in Indonesia. Another example of a recent UCG trial is the Majuba plant operated by South African energy company Eskom since 2007. Again this small trial is portrayed as a success but scratch the surface of the PR and a somewhat different picture emerges. Majuba has experienced (PDF file) at least two casing failures (i.e. ruptured wells) which required “rehabilitation strategies” (read massive cleanup operations). They have also experienced significant problems with “condensate disposal, clean up of syngas and removal of hydrogen sulphide”. In fact Majuba seems to have has had a combination of all the problems experienced by recent trial in Australia, the main difference being the level of scrutiny which the operation is under. While up until now UCG has consisted of small scale testing there are now plans afoot to change that. In the UK the Coal Authority has given away 24 UCG licences and is in the process of issuing 1 more, onshore in Warwickshire (see Creeping Inferno: Underground Coal Gasification Threat Comes Onshore). The British Geological Survey has estimated that there is 17 billion tons of coal suitable for UCG in the UK. A commercial plant might be fed by a number of underground gasifiers simultaneously, each one burning through hundreds of thousands of tons of coal over a period of a few years. Such a plant would be around 100 times larger than present trial plants, with a scale more like a Tar Sands upgrader plant in Alberta. The UCG process also produces large amounts of toxic waste. The gases that come to the surface will include a large amount of steam and coal tar vapours. When these are condensed a witch’s brew of water mixed with benzene, phenols, polycyclic aromatic hydrocarbons and other toxic chemicals (produced water) is formed. The process will yield around 1 cubic metre of toxic produced water for every ton of coal gasified, and given the amounts coal being contemplated, billions of tons, this waste stream will be vast. The handling of this waste will be a huge environmental and human health nightmare all by itself. There are also a lot of safety issues surrounding UCG. Like a nuclear reactor, a UCG gasifier needs to be carefully controlled if disaster is to be avoided. For instance the pressure in the gasifier needs to be kept below that of the surrounding rock formations or else toxic coal tars will quickly be forced into the groundwater. There is also a long history of explosions associated with UCG as mentioned above. However unlike a nuclear reactor the gasifier is totally inaccessible and its exact configuration and state will be largely unknown. Remotely controlling the reaction (basically via the rate at which air/oxygen is injected) will always be very difficult and some accidents are inevitable. At the surface there are equally serious issues to deal with. Gasification will take place over a wide area involving numerous gasifiers, each a kilometre or more in length. However for cost reasons it will be necessary to bring the produced gases together at a central processing plant for separation and treatment of waste. This will involve moving these highly toxic and explosive gases (including carbon monoxide and hydrogen sulphide) over considerable distances in pipelines. The potential for catastrophic accidents that incinerate or poison large numbers of people are much higher than for natural gas. In terms of carbon dioxide emissions UCG is about as dirty as you can get. This is because a significant fraction of the energy in the coal is lost just to run the process, resulting in a much higher carbon intensity than coal. More importantly UCG, as with any unconventional fossil fuel, is just adding to existing conventional fossil fuel reserves that cannot be burned without causing climate catastrophe. Globally it has been estimated that there might be up to 17 trillion tons of unmineable coal, of which 4 trillion tons might be suitable for UCG. Large scale exploitation of UCG could potentially emit enough carbon dioxide to raise global temperatures by a devastating extra 5-10 degrees Celsius. UCG is in many ways the archetypal extreme energy process. Not only is it a massive global threat via the vast store of carbon it could release into the atmosphere but the threat that it poses on a local level is equally severe. From contamination of groundwater with toxic and carcinogenic chemicals, to the massive streams of waste that it will produce and the threat of catastrophic accidents, UCG has it all. Like Tar Sands and Oil Shale a large number of attempts have been made over the last century to scale up UCG into a working energy source, with little success. Now with energy prices sky high and a sophisticated PR effort to dress it up as a green solution, rather than a sign of desperation, UCG is being pushed like never before. This entry was posted in Blog and tagged Underground Coal Gasification, North East. Bookmark the permalink.